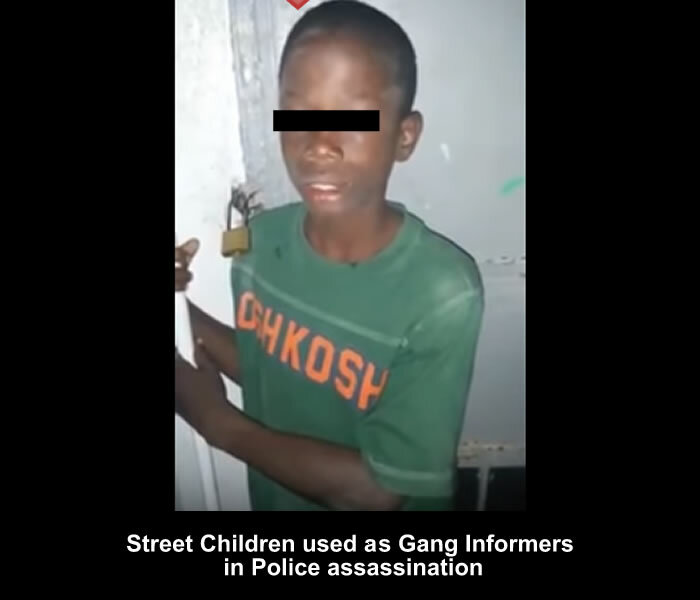 Here is a street child in Haiti used by gang members as their informers to assassinate Police Officers. Haiti has thousand of street children, mostly in Port-au-Prince and the other big cities. In Haiti, there are around 300,000 children that live as Restaveks and 75% of them are girls. Restaveks children are badly treated, often exploited and victims of sexual abuse. They live in unimaginable, unhygienic and precarious environment; seldom receive access to food and education. To stay alive, many of them beg, load buses, wash cars, while others for a better living and protection, join criminal gangs. There was a time when many street children were murdered by the Haitian police, death squads and the former Haitian military. There were certain groups of former military patrols in Port-au-Prince who used to kill street children "for sport." The number of street children in Haiti has increased five times since President Aristide was ousted. In a nation of 10 million, where poverty is common, one of eight children dies before the age of 5, orphanages often are the last refuge of hope-- it is no wonder that thousands of children have made the street their home. If any of them gets killed, no authority ever picks the body or investigates the crime.